Samantha (Sam) Sweet‘s dream is to open her own pastry shop. In the meantime, she has to work for the USDA cleaning out abandoned properties where the owners have defaulted their loans. Both mysteries in Sweet Masterpiece have to do with her USDA job. Cake-baking weaves in and out of sleuthing. Sam is no exception from the rule of amateur sleuths. Amateur sleuths always solve the mystery. Either they announce their success or they lead the police by the hand until the police cannot but figure out the answer. Sweet Masterpiece is of the second category. Shelton has added in a little romance. Her beau is Deputy Beau Cardwell, the detective in charge of both sites. Violence, swearing and sexual content are practically non-existent. You would have to work hard to be offended by any of it. In Taos, New Mexico, Bertha Martinez dies after Sam has broken into her home. But not until Bertha manages to convince Sam to keep a worn wooden box safe, claiming that Sam is its new secret-keeper. Turns out, this box has strange powers to share. Powers that at first freak Sam out. Witchy stuff is suspected. House number two does not have anything paranormal about it. A man’s body is discovered buried on the property. Turns out the body belongs to an artist who had disappeared from the art-world some years ago. Mystery number two is, of course, the one that Sam helps the police solve. Along the way, she is lectured by her deputy that forcing your evidence to fit your theory is a bad idea. Sweet Masterpiece is a mystery of the light-hearted kind. I had fun reading it. We humans are a fearful lot. If anything or anyone differs from the accepted norm, most of us will find some way to avoid that thing or person. Sometimes we’ll use the opportunity to bully and taunt the person exhibiting “strangeness”. The Hob’s Bargain illustrates this ability to pretend that we know how the world should be, even if that means hurting someone we love. Aren’s (our protagonist) family is not excepted from this. They have an hereditary clairvoyant ability that sometimes expresses itself in a more magical one. That makes them fodder for the blood magicians – who feed on death. Aren’s brother was wanted as a magician by those in power, but he did not want to consequences of such a choice. Rather than have his death be used by the blood magicians, he chose to suicide. You can imagine this has affected Aren. It seems she is beginning to experience visions, making her worry about her new husband. When the cottage is broken into, she manages to hide in the food cellar, but Aren knows something is terribly wrong. While hiding in the cellar, Aren suddenly feels a change in the way magic feels. Something has broken, but she has no idea what – being too busy surviving, and all. From that point on Aren’s visions are clearer and the first one concerns the death of her father and husband. Turns out her whole family is gone. Now Aren has to deal with her grief, her out-of-control magic and the changes in the land and her neighbors. So! What do you think the various world-leaders would do if a Near Earth Object (NEO) appeared in the sky? 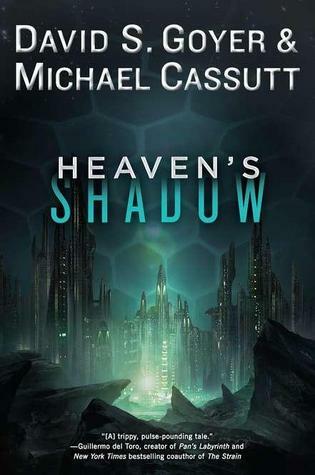 Heaven’s Shadow is about that. Not surprisingly, the appearance sparks a contest between the US and the rest of the world to get to the object first. Two space ships are sent to investigate and they discover more than they had bargained for. The NEO turns out to be alien and not necessarily friendly. Paranoia, curiosity and courage are all displayed along with pretty natural, yet often unwise reactions. Our perspective is from the NASA spaceship’s crews – their actions and reactions. This novel is a fun read. The way people act in it seems pretty realistic. The whole alien NEO thing not so much. But that’s what SciFi is, likely and unlikely thoughts about the future. What is likely is that at some point in the future an NEO could come close enough for us to visit. That’s what makes it so fun to read. Knowing part of the story could possibly happen given a certain set of circumstances.